Last week, I listed the three key lessons I’ve learnt about successfully working with Habits of Mind. This week, I want to delve into the first of these lessons. It’s a critical component, shared by all schools that have achieved long-term success with Habits of Mind. It is a Growth Mindset. A Growth Mindset has always been at the heart of the Habits of Mind. In fact, I don’t believe you can have success with Habits of Mind without a Growth Mindset. Let me explain the connection. The underlying premise of Art Costa and Bena Kallick’s work is that we can learn to behave more intelligently . Habits of Mind describe the 16 dispositions skilfully employed by characteristically successful people. The central message is that we must develop these Habits of Mind to learn how to behave more intelligently. 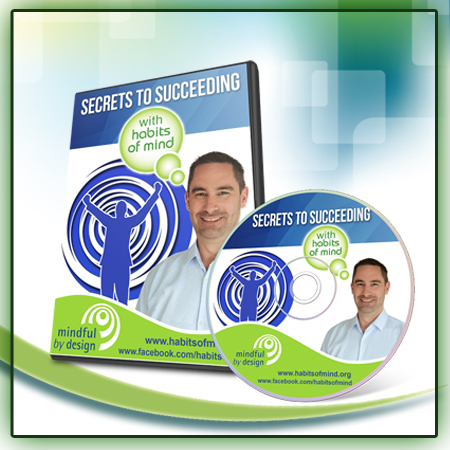 Psychologist Carol Dweck’s work on Mindsets works from exactly the same premise. However, there is a significant difference. Dweck sidesteps the question about whether it’s possible to develop your intelligence. Instead, she asks: How do our behaviours change when we believe our intelligence – and other basic characteristics – can be developed? What Dweck describes as a Growth Mindset is not growth itself. It’s an invitation to grow. It’s an understanding that growth is possible. This belief can have an enormous impact on our motivations and actions. Without a Growth Mindset, we can’t enter the processes that lead to growth. This is critically important for the learner and the teacher. For the learner with a Fixed Mindset, the Habits of Mind describe what intelligent people have. They also identify what other people don’t (and won’t) have. The Habits of Mind help these learners categorise people as either having intelligence or not having it. There is no pathway for future learning; only a way to identify what some people have and what some people don’t. For the learner with a Growth Mindset, the Habits of Mind describe and define what they need to develop in order to become more intelligent. The Habits provide a focus for their efforts. They offer a pathway for future learning and an opportunity for the learner to continually develop their intelligence. When I first read Dweck’s work, I recognised that the schools and teachers succeeding with Habits of Mind consistently approached their work with a Growth Mindset. They instilled in their students the understanding that they had the capacity to become more intelligent. However, because Costa and Kallick’s work pre-dated Dweck’s work, these schools weren’t using the language of a Growth Mindset. Instead, their actions reflected a Growth Mindset. Their behaviours and pedagogy signified their underlying belief that they could help increase students’ intelligence. The problem in schools that struggled with Habits of Mind was that their efforts were being undermined by the kind of Mindset being communicated by school structures, culture and the teachers’ own Mindsets. Many teachers have grown up with messages about intelligence and abilities as being relatively fixed and stable. Children (including ourselves) have been ranked and grouped by ability. They have been categorised as being a type – eg. mathematical, artistic, scientific, etc. These messages create a pervading Fixed Mindset, which permeates the classroom and, in turn, our work with Habits of Mind. This is what Dweck and her colleague Susan Mackie call a False Mindset. Someone with a False Mindset may intellectually understand that intelligence is a learnable construct. They may even advocate a Growth Mindset and the importance of the Habits of Mind. But they have failed to deeply reflect upon their own history and beliefs. Because of this, they do not have an insight into how their history and beliefs have influenced their own Mindset. They may, in fact, act from a more Fixed Mindset perspective, and unintentionally pass these Fixed messages on to their students. Habits of Mind are about learning to behave more intelligently. However, many schools and teachers have failed to recognise or act on the incongruence between this message and the Fixed Mindset messages that have traditionally been part of school and the broader community. As a result, their efforts to develop more intelligent behaviours have been undermined by the Fixed Mindset belief that intelligence is unchangeable. Today, we know better. We not only recognise that intelligent behaviours can be taught – we recognise the importance of understanding that this change is possible. We understand the Growth Mindset, and we understand how to nurture and develop it in ourselves, our students, our classrooms and our schools. The key to leveraging our work with Habits of Mind is to develop a Growth Mindset culture. The lesson I learnt – possibly the single most important lesson – is that the Habits of Mind and the Growth Mindset are intimately connected. The Habits of Mind describe how to teach students to behave more intelligently. But our efforts to do this will fail if we operate from a predominantly Fixed Mindset. To succeed with the Habits of Mind, we must establish a Growth Mindset in our schools, our teachers and our students. Then, and only then, are we likely to see the promise of the Habits of Mind fulfilled. Next week, we will explore Lesson 2: A whole-school approach.